Split your players into two teams if you have pinnies use them as it helps with clarity. 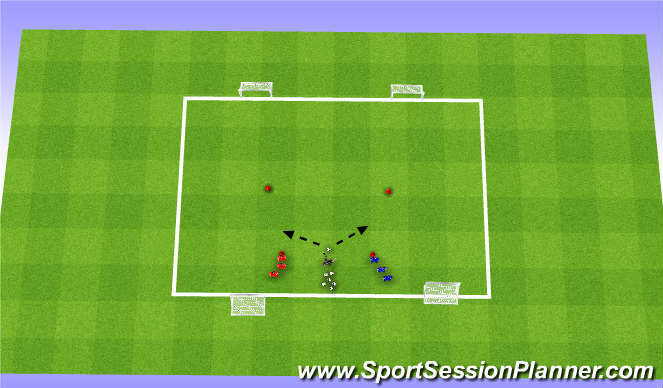 Have the teams stand either side of the coach with all the soccer balls with the coach in the middle. Near the centre of your field place two cones roughly about 10 yards apart. The coach should play a ball out to one of the two teams. The first player in each line runs out and tries to knock the ball of each cone. If a goal is scored or the ball goes out of bounds the coach shouts â€œGet Out of Here" and plays in a new ball straight away for the next players. Can the players move as soon as the coach plays the ball in? If one ball is blocked by the defender can we change direction and try to score with the other ball.